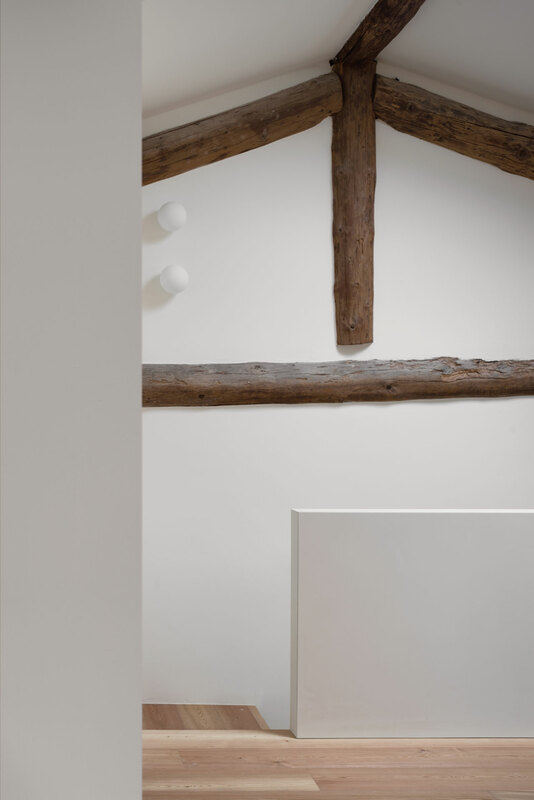 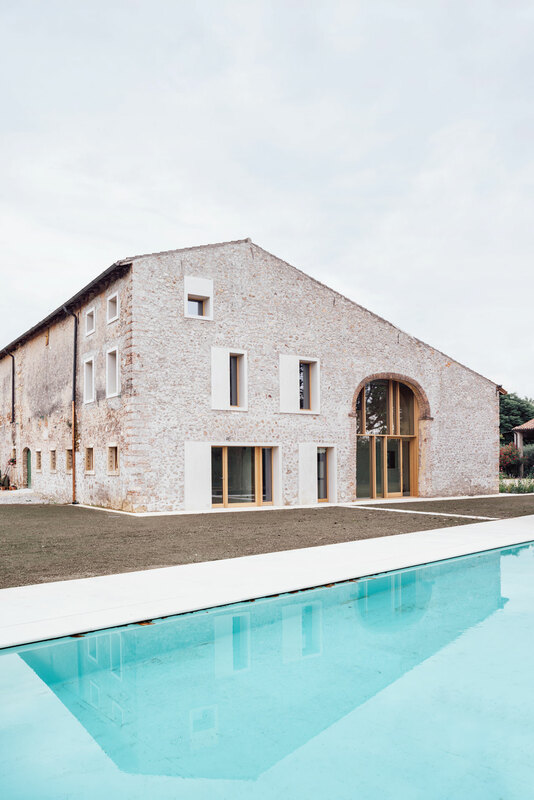 Located in Chievo on the outskirts of Verona, near the Adige River, this elegant country house occupies a converted stone barn that has been thoroughly renovated by Milan-based architecture practice Studio Wok. 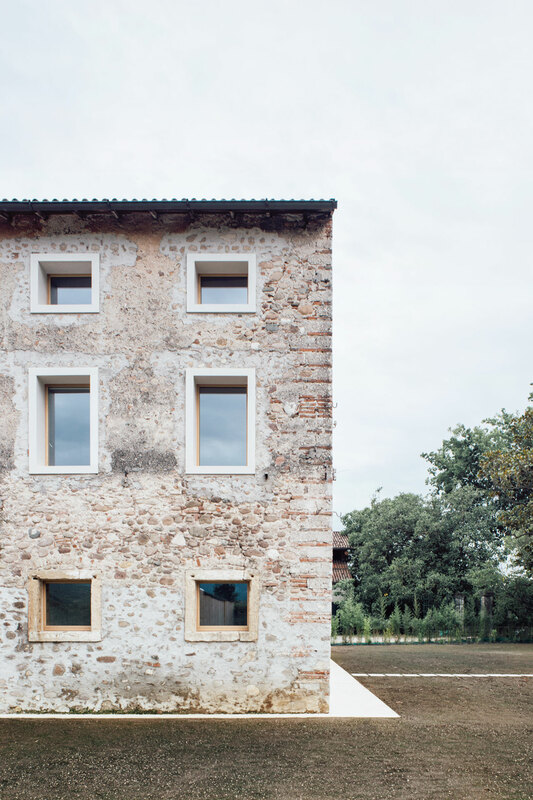 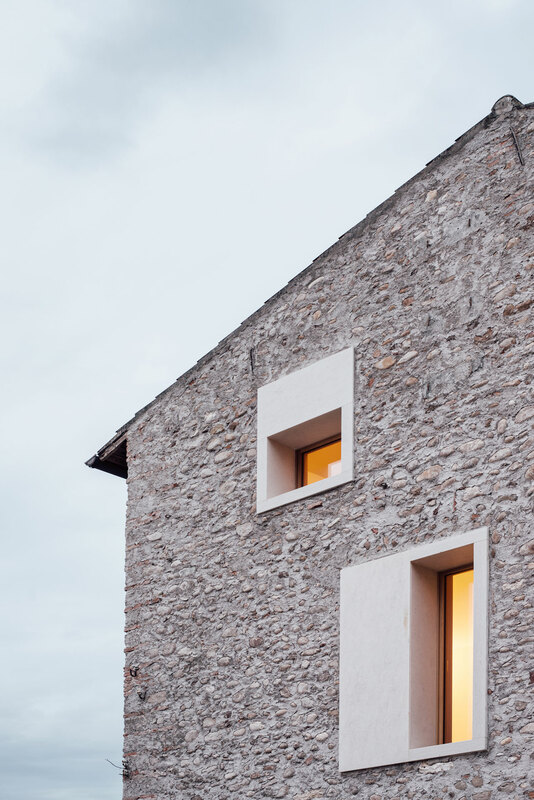 Conceived as a spatial and material dialogue between the historic rural building and the architects’ contemporary interventions, the three-storey family home seamlessly combines the requirements of modern living with the setting’s agricultural heritage while also promoting sustainable design through energy efficiency, the use of local and recycled materials, and landscape preservation. 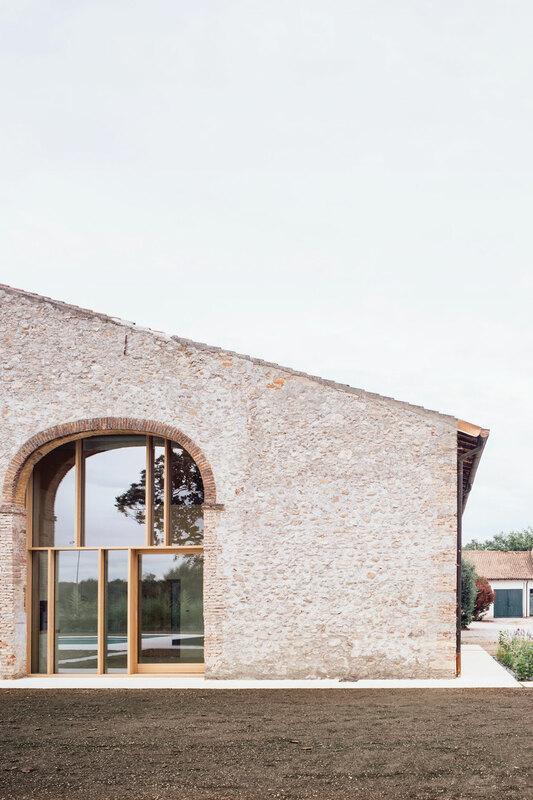 Externally, the barn’s load-bearing walls have been stripped of their plaster to reveal a beautiful texture of river pebbles. 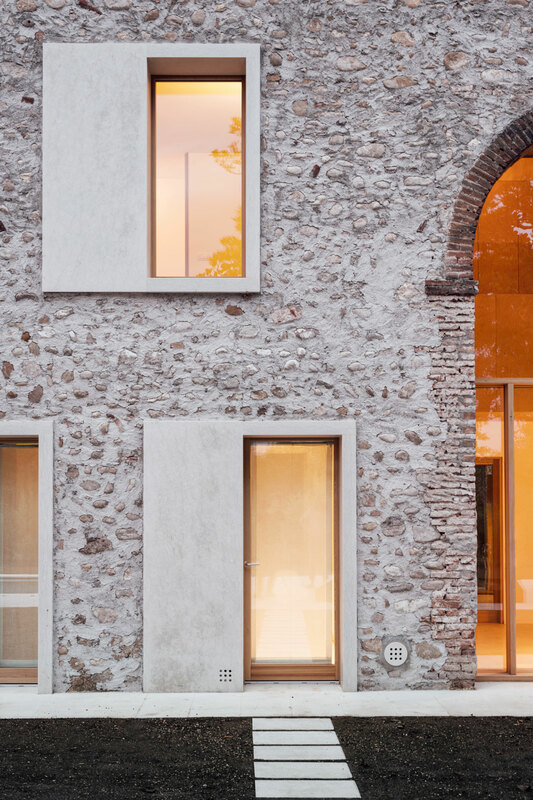 Strategically placed windows and doors, framed by off-white Biancone marble sourced from local quarries, puncture the walls creating a playful geometrical composition. 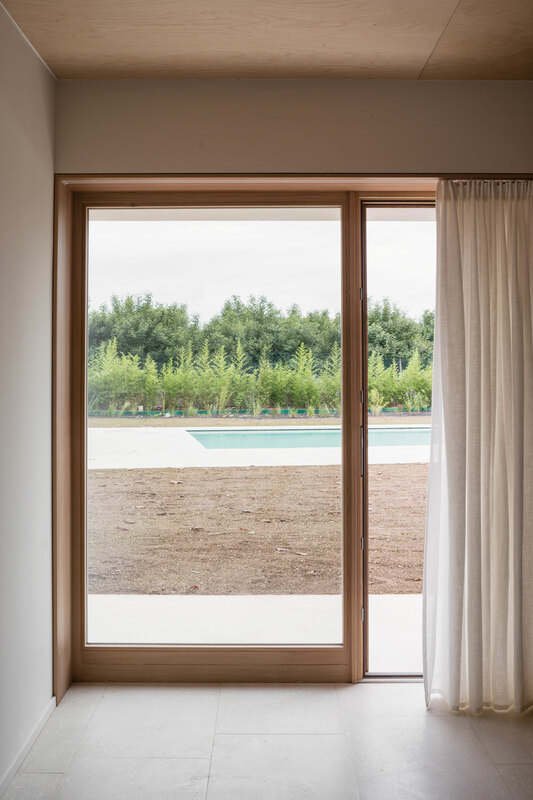 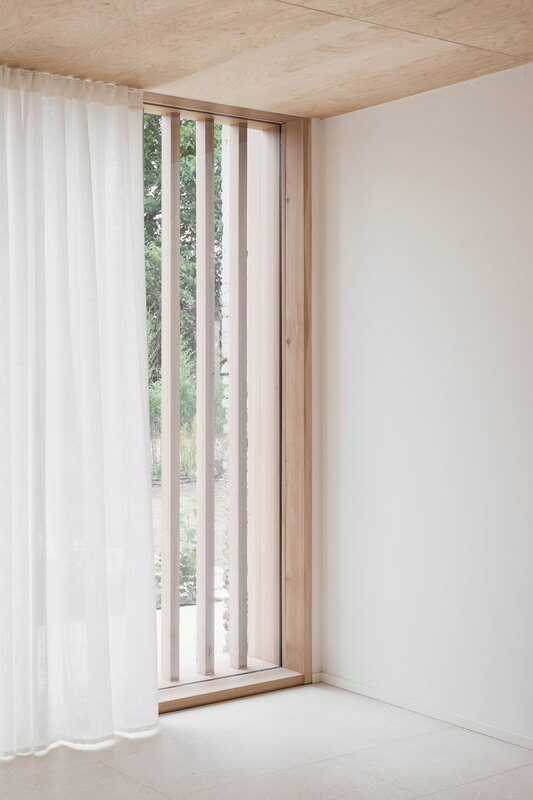 The windows, along with a pool-facing, double-height arch that has been re-opened, and floor-to-ceiling glazing on the side of the building, allow plenty of daylight to illuminate the interior and a plethora of views of the surrounding countryside. 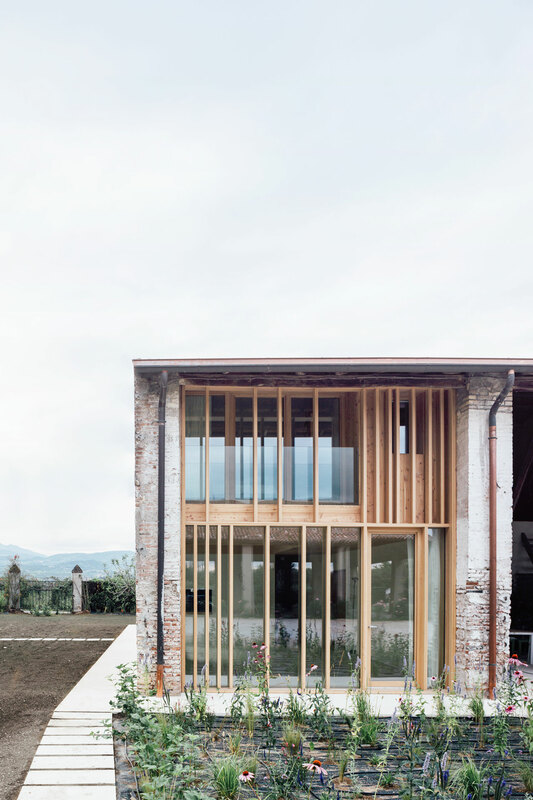 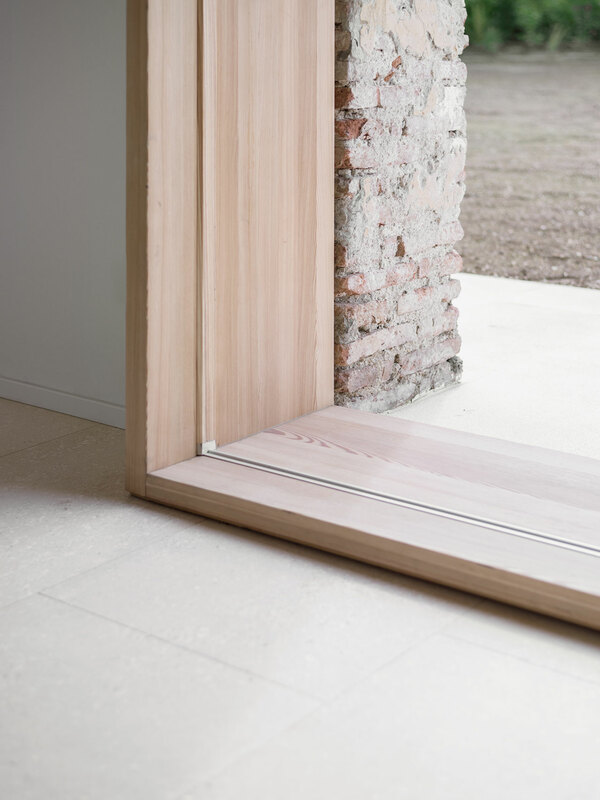 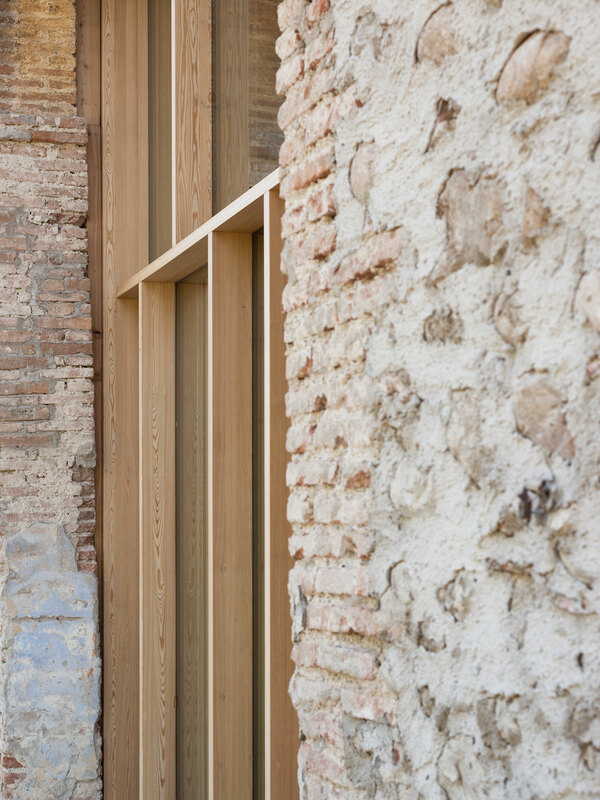 The use of local marble, stone and river pebbles reference Verona’s vernacular architecture as do the vertical wooden slats on the glazed side façade, modeled on the typical barn construction found in the area, which provide solar shading. 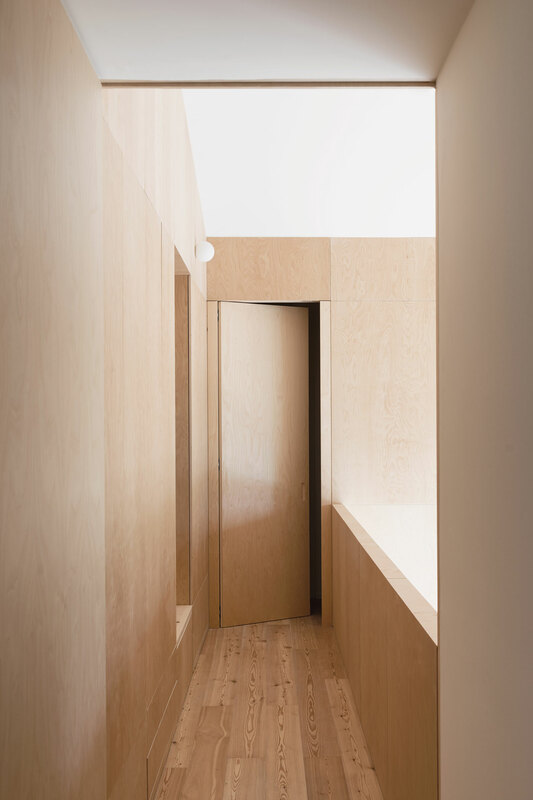 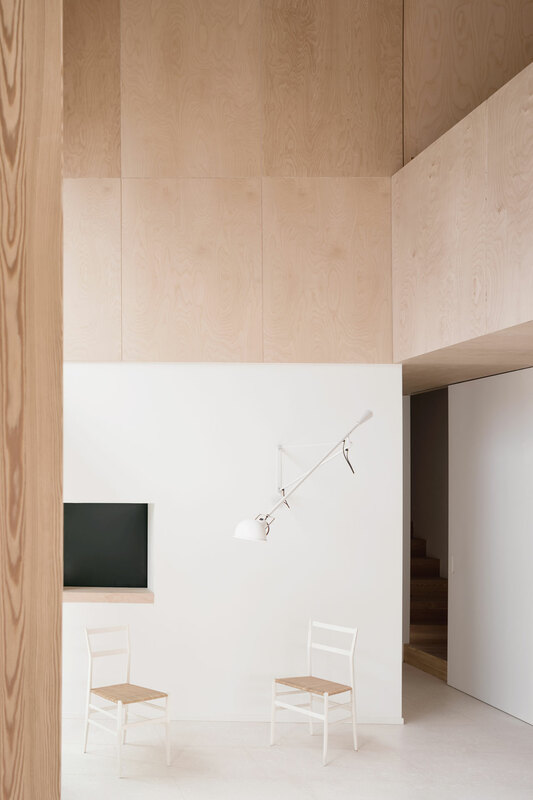 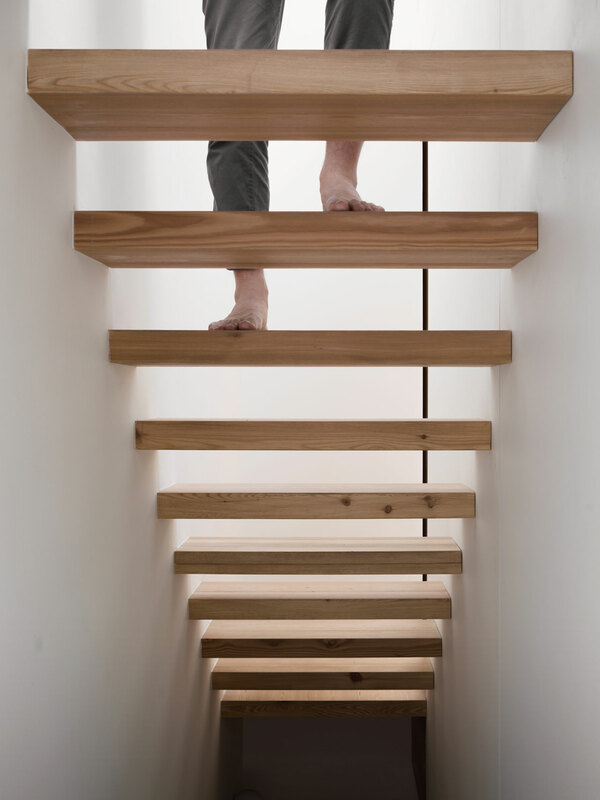 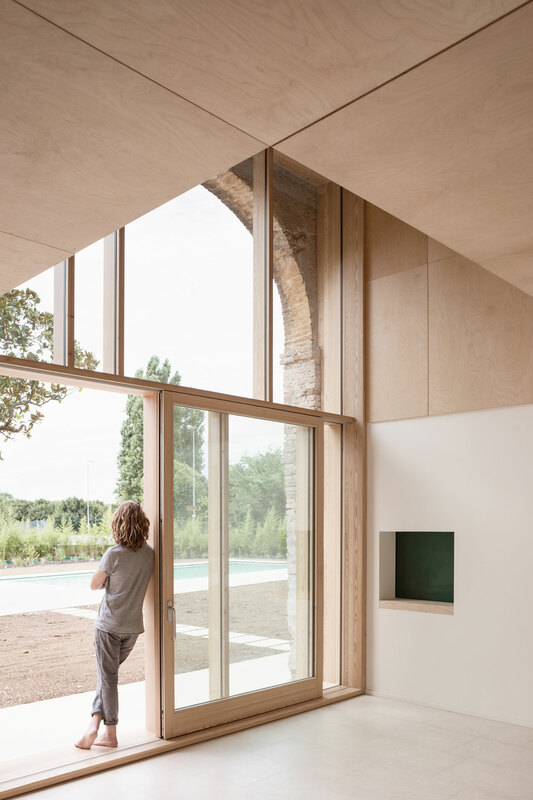 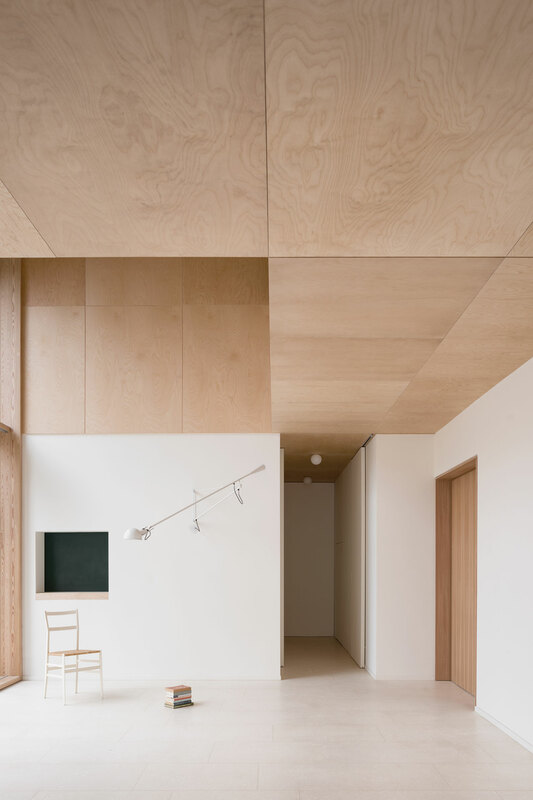 The use of natural materials continues in the interior of the house: Vicenza stone pavement defines the common areas on the ground floor while birch plywood cladding envelops the private quarters on the first floor, and exposed timber beams on the second floor reference the building’s former use. 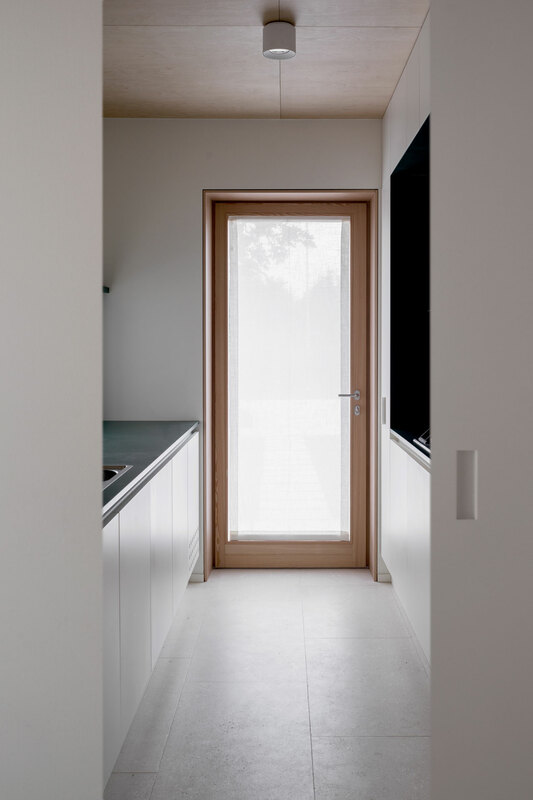 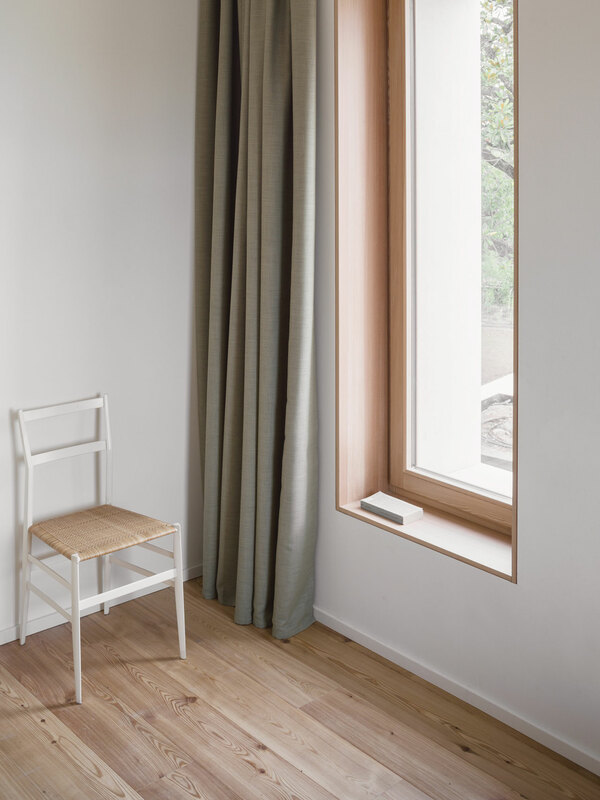 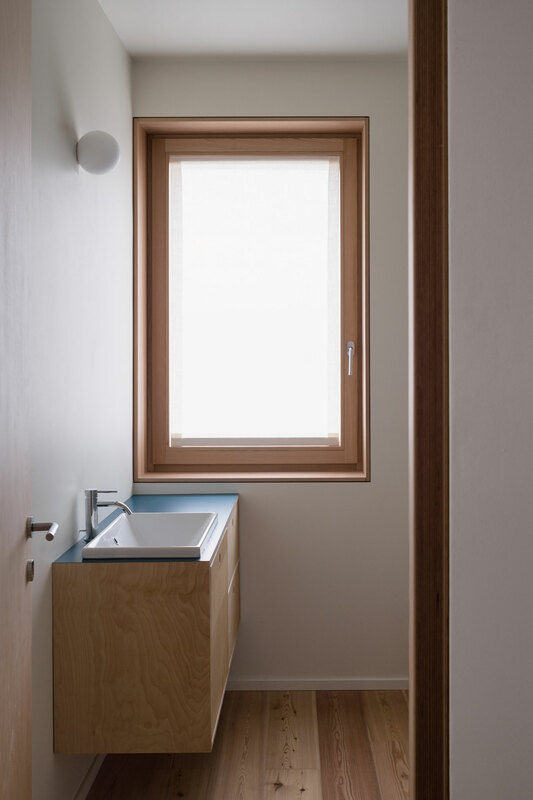 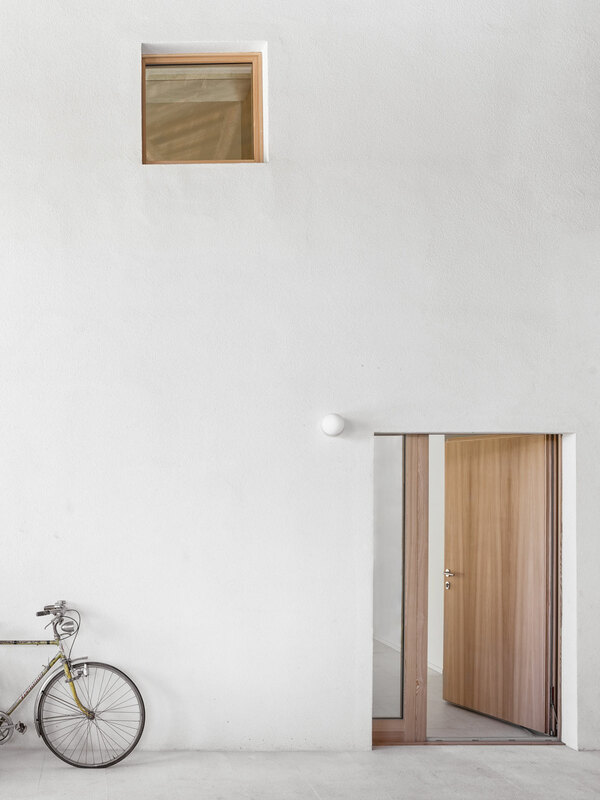 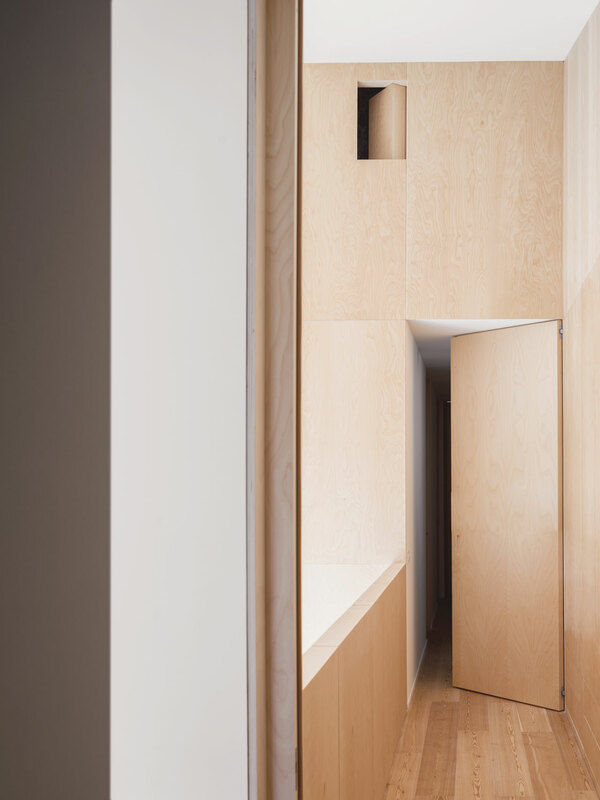 Having chosen an austere, minimalist approach in the design of the interiors, the architects have eschewed any decorative elements and have gone so far as to efface furnishings wherever possible, from door handles to balustrades. 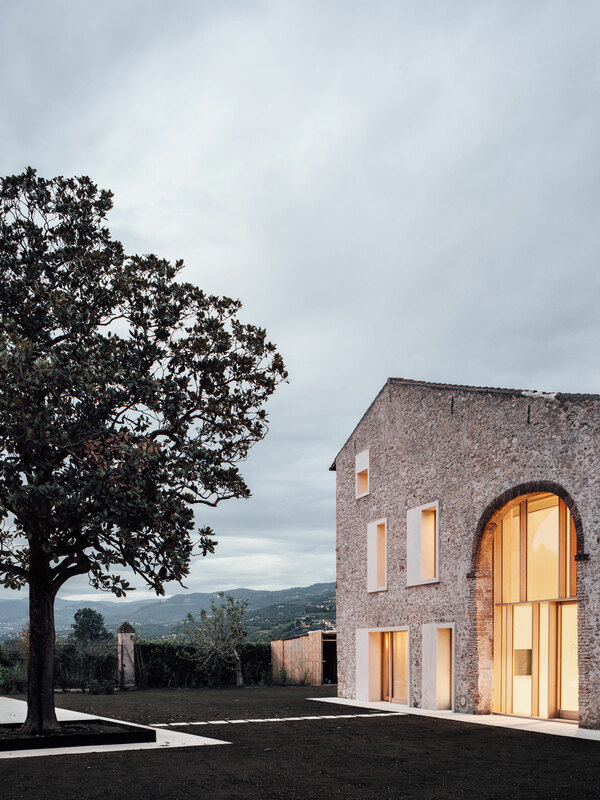 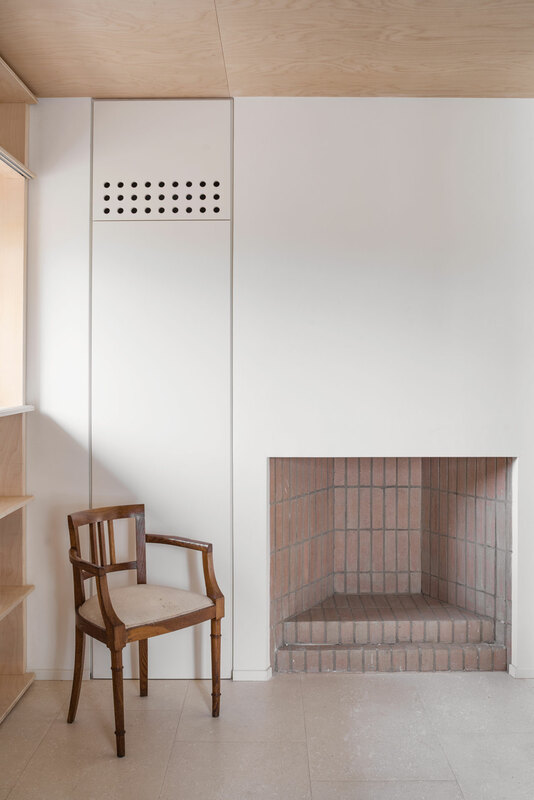 On the ground floor, a large living and dining room is centred on a double height space fronted by the glazed arch that opens up onto the garden, while a brick fireplace is the focal point of the library. 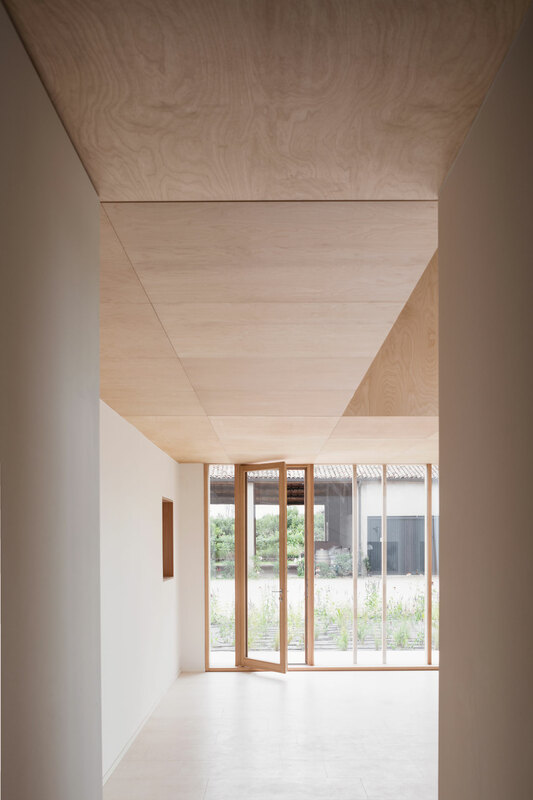 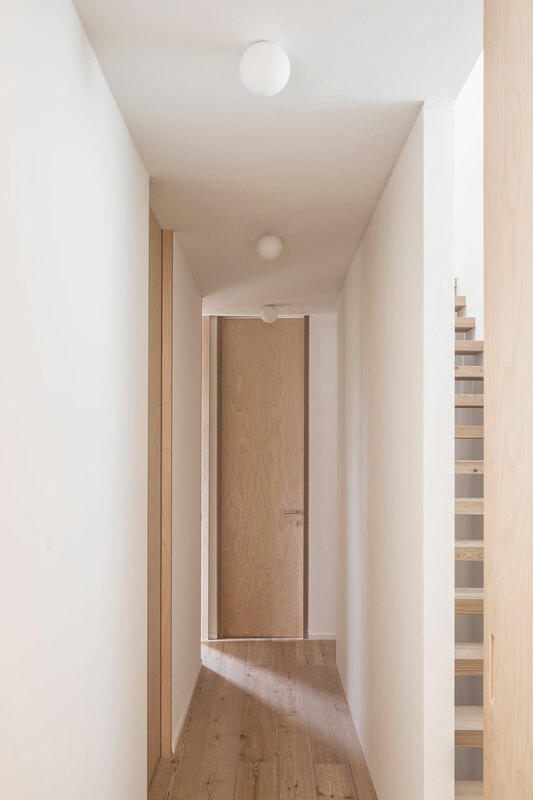 Upstairs, the three bedrooms, which have been conceived as a wooden volume hanging from the building’s roof, are engulfed in the warmth of the natural timber finishes, whereas the family room on the top floor is a white-washed abode punctured by small windows and skylights. 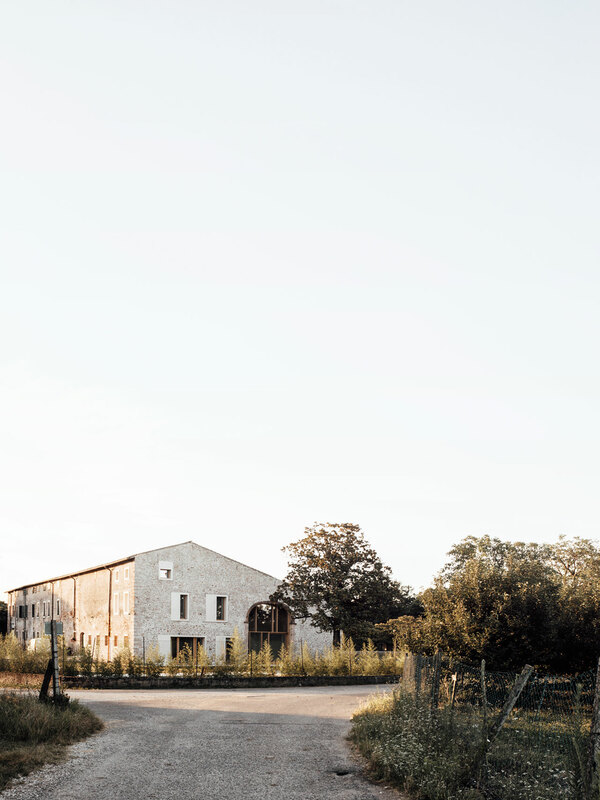 The owners’ passion for preserving the property’s rural character is poetically encapsulated by their insistence on keeping intact the tall magnolia tree that is now the centre piece of the re-designed garden. 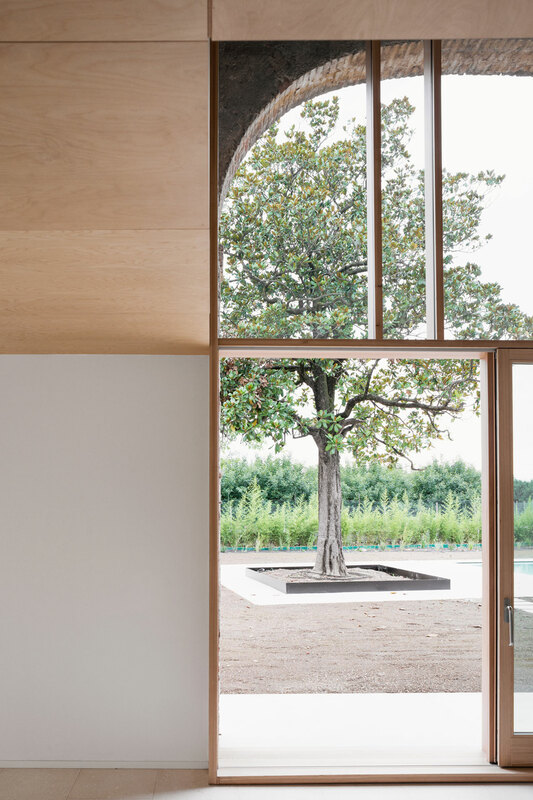 Majestically standing by the pool, and framed by black metal edging that pops out against the white paving, the tree, which is as tall as the house and can be seen from all the rooms, not only provides a beautiful focal point but also casts mesmerizing shadows on the stone façade as the sun sets over the horizon, providing yet another graceful reminder that nature and the built environment ought to coexist in harmony.